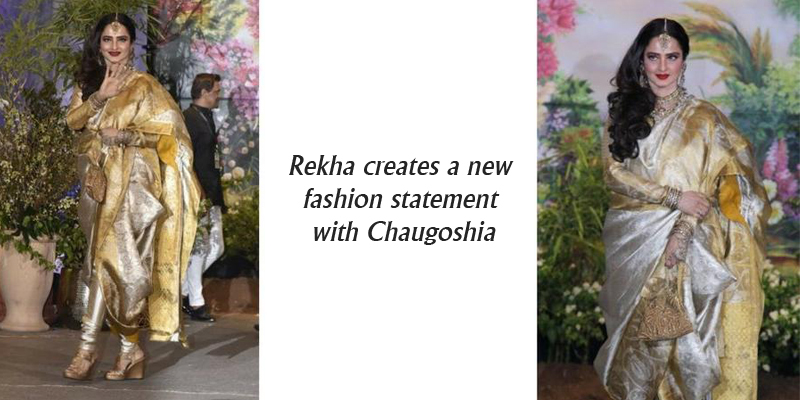 Rekha, the evergreen Bollywood star has never failed to impress her admirers. Be it with her remarkable acting prowess or her sense of style, Rekha surely knows how to captivate attention. Wherever she goes, her fashion sense becomes the talking point and it is always up to the mark. We have always been in complete awe of her exclusive Kanjivarams that steal the show every time she drapes one. This time though, she chose to put on a Chaugoshia or more famously referred to as the pant-style saree. Sonam Kapoor and her husband Anand Ahuja both define fashion goals and it was absolutely justified for them to have a wedding that beautifully enveloped the essence of true fashion. Everything from the Mehendi , Sangeet to the Wedding Reception turned out to be a major fashion event where every guest was seen to be flaunting their best. While the ladies brigade in Bollywood was seen either in their most charming designer Lehengas or sarees, Rekha, at 63 made heads turn with her pant-style saree. For those, who are still finding it confusing to understand what was she actually wearing, it is a traditional attire named Chaugoshia. This media-hyped so called pant-saree has been in our Indian culture for over 150 years. This garment was worn by women in Hyderabad during the Mughal rule. Women used to drape this stylish sartorial style attire at their weddings. For Sonam Kapoor and Anand Ahuja’s wedding reception, Rekha used one of her exquisite golden cream Kanjivaram sarees as the dupatta for perfecting the Chaugoshiya style. Hope to see many more such exclusive attires from the Diva in the future who we always look up to.